Mitt Romney beat Barack Obama by 22 points in Kentucky in 2012; so you’d think there would be no chance that a Democrat could win a Senate seat there. Unfortunately, the same lack of charisma and ineffectiveness as a leader that has made McConnell a disaster as Senate Minority Leader has turned off the voters in Kentucky as well. McConnell has a Todd Akinesque 40% approval rating in Kentucky and a 51% disapproval rating which explains why he’s the Democrats’ #1 target in 2014 and is currently losing in a poll to his Democrat opponent, Alison Lundergan Grimes. If the Republican Party were smart, which it’s not, the RNC, NRSC, Karl Rove, etc., etc., etc. would be quietly urging Mitch McConnell to retire so that his conservative challenger Matt Bevin could retain the seat in a walk after he builds up his name recognition. Worse yet, Mitch McConnell is a powerful man in the party. He has so much juice that even Rand Paul is supporting him because McConnell could help him out with fund raising for his 2016 campaign. Additionally, supporting McConnell sends the signal to the party establishment that Paul’s definitely not his dad, which would make him more palatable to the moderates in the party. So, not only is Rand Paul backing McConnell, he loaned him his campaign manager, Jesse Benton. Yesterday, we got a little taste of what Jesse Benton really thinks of McConnell. Mitch McConnell’s campaign manager, Jesse Benton, told an Iowa conservative activist in January that he is “sort of holding my nose for two years” working for McConnell to benefit Rand Paul in 2016, according to a recording of their phone call posted Thursday. Benton helped Paul get elected to the Senate in 2010, then moved to McConnell’s reelection campaign last fall, one sign of a carefully constructed alliance between the two Kentucky Republicans. The activist, Dennis Fusaro, told POLITICO that he provided a recording of his Jan. 9 phone call with Benton to the blog, Economic Policy Journal, which posted it Thursday. Fusaro said the recording is authentic. “Between you and me, I’m sort of holding my nose for two years because what we’re doing here is going to be a big benefit to Rand in ’16, so that’s my long vision,” Benton said in the call. Paul is believed to be gearing up for a run for president in 2016. Isn’t this a big part of the Republican Party’s problem in a nutshell? We run guys like McConnell that the base doesn’t like and insist that the fact conservatives don’t like them very much is a plus, not a minus. Then when the lack of enthusiasm turns into flat numbers at the polls, we blame conservatives. Well, Benton’s comments should be a wake-up call even to the dead eyed establishment RINOS who run the NRSC. 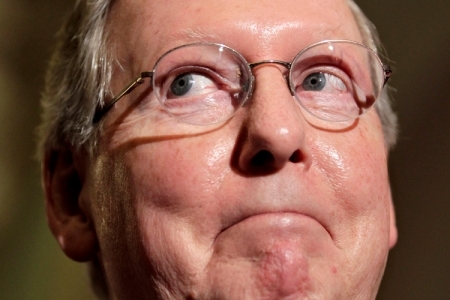 When you embrace McConnell, you’re embracing another Todd Akin and risking a seat that should be a slam dunk for the GOP.